In android, you can define your own custom fonts for the TextView in your application. You just need to download the required font from the internet, and then place it in assets/fonts folder. After putting fonts in the assets folder under fonts folder, you can access it in your java code through Typeface class. 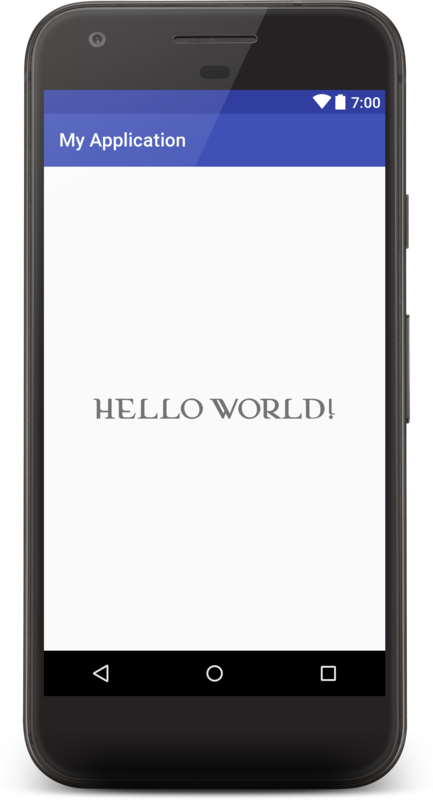 In this example, we are going to make a custom Android TextView that can change its font, by customizing its attributes from the XML. Open Android Studio and choose “Start a new Android Studio Project” in the welcome screen. Go to Chapter 1 – Getting Started with Android Programming for creating new Android Studio project. Create a new folder named assets inside src/main/ folder. Then add a new folder named fonts inside src/main/assets folder. Now we are going to add some .ttf font file inside. Create a new XML file inside /values/ folder, with the name attrs.xml. We should have the /values/attrs.xml file and paste the code below. Create a new Java class file named MyTextView and paste the code below. * Created by Akshay Raj on 28-04-2017. Create another file named FontCache and copy below codes. Add your Custom Text View in activity_main.xml file. If you want to change your TextView font then set your font in app:font="YOUR_FONT.ttf"